Many people find that the symptoms of major depression or bipolar depression come and go in a pattern that is unique to them and fairly unpredictable, even with treatment. You may have an episode now but then no symptoms for a few months or years. When this happens it is called a relapsing and remitting condition. You can gain some control over this by paying attention, responding to your Triggers and Warning Signs, and following your Relapse Prevention Plan. Triggers are events that cause you distress and may lead to an increase in your symptoms; Warning Signs are distinct changes from your baseline that precede an episode of depression or mania; a Relapse Prevention Plan is a day-to-day approach to help you identify, monitor, and respond to changes in your symptoms. 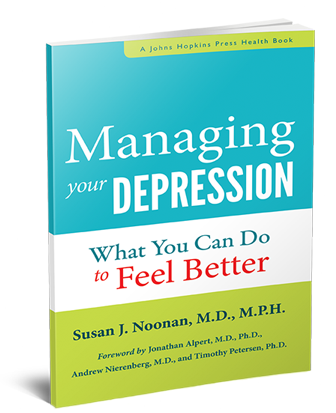 These are tools that I discuss in my new book, Managing Your Depression: What You Can Do to Feel Better, published by the Johns Hopkins University Press. But it can be frustrating to plan your life when you wonder what is coming next around the corner, if or when. Do not allow the possibility of symptoms returning control your life. This guest post by Dr. Noonan first appeared on JHU Press Blog. Read the full post here. This entry was posted in Relapse Prevention. Bookmark the permalink. Post a comment or leave a trackback: Trackback URL.